In "Once You're Lucky, Twice You're Good", BusinessWeek technology and Yahoo! Finance writer Sarah Lacy paints an interesting picture of the "Web 2.0" scene and the companies and individuals in it. An excerpt (focusing on Marc Andreessen and Ning) was featured in a May 2008 BusinessWeek issue and the basis for Lacy's book was from a Aug 2006 BW cover story (that featured Kevin Rose) she co-wrote. Back to the book itself... "Web 2.0" roughly refers to the new generation of companies that have formed since the 2000/2001 tech downturn and includes some big and sure to be bigger companies as well as still building start-ups that may or may not make it on their own. Just as the companies in these categorizations run the gamut, so do the lead players that Lacy chronicles in her book. - Facebook: Currently the hottest privately owned Web 2.0 company (and perhaps hottest private or public Web 2.0 company depending on how you compare it to News Corp. owned MySpace). Lacy spends a good amount of time detailing Facebook as a company, but also Mark Zuckerberg as it's founder and CEO. - LinkedIn: Right up there with Facebook as a predicted billion dollar company once it does go public. It's similar to both Facebook and MySpace in that it's a Social Network, but different in that it's designed for the professional set. Founder and Chairman Reid Hoffman is also profiled by Lacy, just not in as much detail as Zuckerberg. - Ning: Another Social Networking company, only different than the prior ones mentioned in that it's much newer and aspires to the platform status achieved by the others. One of the more interesting things that Lacy writes about Ning is that it was co-founded and heavily funded by one of the leading statesman of tech (and now CTO of Ning), Marc Andreessen. - Slide: A very interesting company. I had only peripherally heard of Slide prior to reading Lacy's book, but now know it to be the force behind some of the most downloaded applications on Facebook and MySpace. One of the things that makes Slide interesting is it's nature as a "widget" or application company. People constantly use Slide products, but may not even know who is behind them... and have to go to one of the "platform" companies/websites to use them. Heavily chronicled in Lacy's book is Slide (as well as PayPal) creator Max Levchin. - Yelp: A review website that has individual member posts on their favorite bars, restaurants, doctors and dentists (and of course many other categories) for a given local. - Digg: A story ranking site where members "digg" specific articles found on the web, which then get listed as the "top stories" on the Digg website. A fascinating idea that seems to get at the best aspects of "participatory news". Digg also has some of the highest star power of the Web 2.0 companies as it was started by tech entrepreneur and BusinessWeek cover guy Kevin Rose. - Six Apart & Blogger: Both "guts" companies that created (and continue to create) tools for use in blog writing. - Technorati: Blog search engine. - Twitter: Hmmm... not sure how best to describe Twitter so I'll just use the verbiage from it's homepage.... "Twitter is a service for friends, family, and co–workers to communicate and stay connected through the exchange of quick, frequent answers to one simple question: What are you doing?" 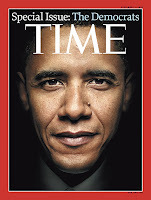 Posted on this blog back on July 29th was "Obama Coverage from Time Magazine"... a look at two different pieces from the Aug 4 issue of Time, each likely giving optimism to Obama supporters hoping he comes out on top in November. Since that time, there has been a very focused Republican effort to chip away at Obama and his prospects in the election. 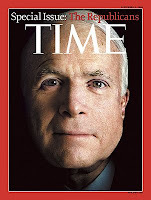 Stemming in part from those efforts, McCain has gained in the polls and two different pieces in the Sept 1 Time Magazine likely boost the spirits in the opposite camp, supporters of John McCain. In his "A Working-Class Hero?" commentary, former McCain strategist Mike Murphy writes about how Obama needs to focus efforts to try to win votes from what Murphy calls the "lunch-pail wing of the Democratic Party". Additionally, columnist (and frequent McCain critic) Joe Klein writes his "In the Arena" piece with the title (and subtitle) "Where's the Passion?... Obama's measured style might cost him the election". These doom and gloom (or perhaps simply helpful advice) pieces duly noted, the issue's cover story (well, the cover story was actually a series of articles on Obama and the Dems) was a terribly interesting piece titled "The Five Faces of Barack Obama" by David Von Drehle chronicling multiple views of how the candidate is seen. Also in the issue was the editor's letter about the election coverage Time has on their site at The Page and Swampland.